Tough Trip Through Paradise; I borrowed the title of Andrew Garcia’s classic book documenting his travels through the old wild west to describe our backpack trip up to Kindy Ridge, a lonely rocky highland next to glacier-covered Snowking Mountain deep in Washington State’s North Cascade Mountains. You won’t find Kindy Ridge mentioned in many guidebooks or backpacker’s trip reports. Mountaineers know of it as an access route to climb Snowking and the “trail” is an unmarked, unmaintained steep goat track kicked into the mountainside by climbers’ boots. No doubt, it is a tough trip, but it’s paradise once you finally arrive. There were three of us; me, Brice and his wife Aline. Parking at the unsigned trailhead outside of Marblemount, Washington near the Cascade River the trip starts easy enough, the first couple miles along a brushy, long abandoned logging road. But at road’s end the work begins and for the next five hours we would struggle up steep slopes through dense huckleberry fields, loose rock, mud and – no water. It was late August and every creek, seep and gully was dry as a bone. In fact, there was no accessible water until reaching a few snow patches hidden away in a few deep ravines above 5,000 feet. Taking just a liter of water each, we ran out halfway up and resorted to eating huckleberries to quench our thirst which worked remarkably well. At times we would use hands and feet to crawl up rocky gullies or through tangled piles of blown down timber all the while thinking about how it would be coming back down through this in a few days. As an old climbing partner of mine used to say, it was steeper than a cow’s face. In two or three miles we would climb over 3,500 feet to an unnamed rocky ridge (called simply point 5791 – its elevation). So why take such a punishing trek? 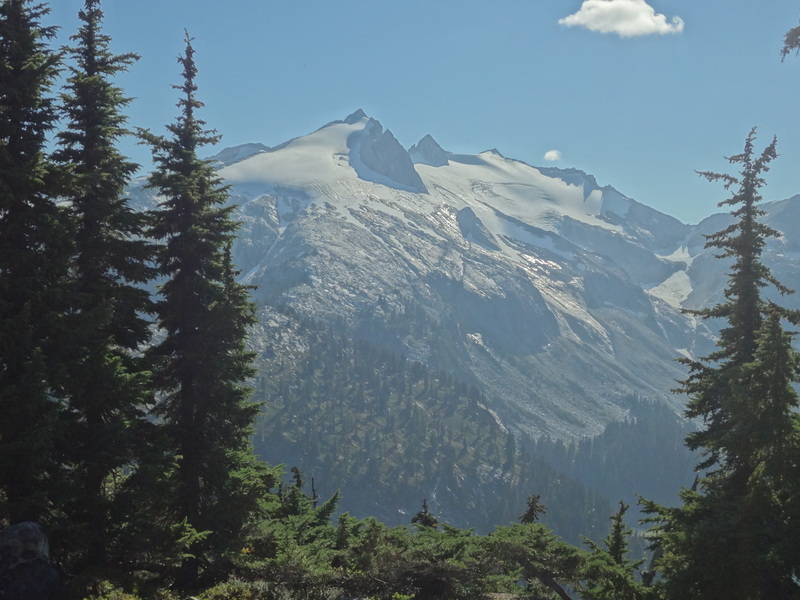 No people and a magnificent pedestal deep in the wilderness from which to view some of the giants of the North Cascades; Snowking, Formidable, Eldorado – each with its glaciers hanging over turquoise lakes and virgin subalpine forests. It was worth the pain. Our goal was to reach Cyclone Lake beneath Snowking Mountain. But we reached a rocky basin just below point 5791 too thirsty and exhausted to make the last one and half miles to the lakes, so we made camp near a rocky ravine that held some summer snow, our first water since our bottles ran dry hours ago. First chore; melt snow for water. After that up went the tents. We were too tired to eat much so we made a small fire and watched the sunset across the glaciers of Snowking, sipping whiskey before turning in. The next day we decided to move our camp up to the actual highpoint above us and were glad that we did. It was a wide open garden of heather and glacier scoured rock. We found the trail to Cyclone Lake at the southern end of the point, but decided to rest in the sun instead, lounging on sun-warmed slabs of granite and never tiring of the glacier-covered mountains all around us. It was a glorious summer day, downright hot, and would have been perfect except for the mosquitos which were out in force. Strange for so many mosquitos in such a dry place. The other strange thing was lack of wildlife. I had expected mountain goats, elk, maybe bear, . . . deer at least, but nothing except a few birds, chipmunks and a single hawk patrolling above. But the views and acres of ripe huckleberries made up for the lack of wildlife. Another thing about point 5791 – it was kind of dangerous. The smooth rock was fissured with cracks, some wide, some narrow, but all of them very deep. In many places roots and dirt had built up over these cracks to form traps into which you could easily break an ankle, or worse, fall through entirely. And help would be a long, long way away. The next day, time to go out. First we enjoyed a spectacular sunrise over the mountains and canyons. Our water supply, a small snow patch, had melted to half its size during the previous day. Another day or two of hot, sunny weather and there would be no snow left leaving the ridge dry and waterless. And, after spending the previous day resting, we were ready for the descent. As old backpackers know, going down can be harder and more dangerous than going up. Descending is less aerobic than ascending, but it is strenuous to step down while maintaining control in rough, steep country. All of us fell at least once on the way out, slipping on mud-covered rocks or over hidden roots. But you didn’t fall far since the slopes were so steep you’d just roll back onto your pack against the steep slope behind when your feet slipped out from under you. The descent took almost as long as the ascent we had made two days previous, but we made it without injury (except for lots of mosquito bites). Ironically, once back at the car Brice saw the only major wildlife sighting of the trip, a great grey owl prowling along the roadway. As we say, the trip isn’t over until the final reward has been received, . . . in our case a micro-brew and burger at the Buffalo Inn in Marblemount. Then, the 2 ½ hour drive home to clean up, rest up and prepare for the next trip in a few days, . . . The volcanic highlands and glaciers of Mt Baker.